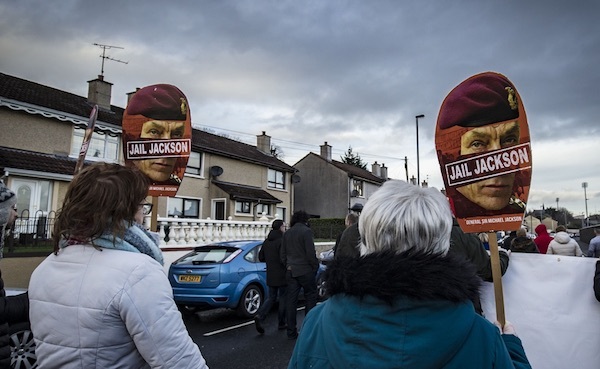 The reference is to General Sir Michael Jackson, second in command of the paratroopers who stormed into the Bogside in January 1972 and shot 28 unarmed civil rights marchers, killing 13. He was later NATO commander in Kosovo, then Chief of the General Staff, Britain’s number one soldier. Jackson was directly involved in the Derry massacre, standing in the shadow of the Rossville Flats as the killing went on around him. He was to tell the Inquiry under Lord Saville that he could not remember seeing a gun fired or a person struck by gunfire. Ludicrous. Jackson was also the main architect of the cover-up. Yet Saville made no finding against him. Jackson is still regularly and respectfully interviewed in the media about military action and the morality of war. Meanwhile, controversy rages about the criminal investigation of a number of privates and corporals. The top brass gets off scot-free, the rank and file takes the rap. An old, old story. On any rational estimation, Jackson and his fellow senior officers were far more to blame for the massacre than the men who pulled the triggers. Saville’s failure to face up to this fact was important for David Cameron’s ability to stand up in the Commons and declare that the killings and woundings had been “unjustified and unjustifiable”--while simultaneously insisting that they had left no stain on the reputation of the British army. If the role of the top man in the military hierarchy had been exposed, Cameron could not have suggested that only “rogue” soldiers had been involved. Saville’s determination to exculpate Jackson is even clearer from the twisted tale of how he came to construct the cover story which went out to the world as the “official” account of the slaughter. After Jackson’s “I know nothing” nonsense, a different version of his role was to emerge during evidence from Major Ted Loden, commander of Support Company of the First Paras. He described how, late in the afternoon of Bloody Sunday, he had taken statements from each of the shooters and plotted map references showing in each case the location of the shooter and of his target and had noted the soldier’s account of why he had fired--the target had been armed with a gun or a nail or petrol bomb etc. He explained that he had interviewed the soldiers as he sat in the back of an armoured vehicle at Clarence Avenue, a few hundred yards from Rossville Street, with the map spread out on his lap and by the light of a battery-powered lamp. He listed 14 “engagements”. But when the original documents were produced, they turned out to be not in Loden’s handwriting but in the handwriting of Chief of Staff Jackson. How could this have come about, Loden was asked. “Well, I cannot answer that question,” he replied. None of the shots described in the list conformed to any of the shots which evidence told had actually been fired. Some of the trajectories described took bullets through buildings to find their targets. The other documents in Jackson’s hand were personal accounts of the day’s events by Wilford, the three para company commander who had been present and the battalion intelligence officer. It is impossible to believe that Loden could have misremembered this, or that Jackson could have forgotten writing it all out military just a few hours after standing in the middle of the shooting spree. Jackson was clearly committing perjury. However, having declared that it was not clear how the cover-up based on the documents might have worked, Saville continued: “The list did play a role in the Army’s explanations of what occurred on the day.” He cited an interview on BBC radio at 1am on the day after Bloody Sunday in which the army’s head of information policy in the North, Maurice Tugwell, had used the list as his basis for explaining the “shooting engagements”. The shot-list was also distributed to British diplomatic missions around the world as a guide for answering questions about the killings. Saville seems not to have considered a conclusion that here we had not just evidence of a conspiracy but clear sight of the conspiracy in action, and with Jackson at the heart of it. Had this been among Saville’s findings, Jackson would have been branded as a liar out to cover up unjustified and unjustifiable killings. Cameron would not have been able to make the Commons speech since hailed as a major contribution to reconciliation and even “healing” in Ireland. Directly contrary to the widespread praise of the report, endorsed by the vast majority of mainstream political opinion and media outlets, Saville had not told the full truth. He cleared the dead and wounded and this was rightly welcomed--but he stopped short of admitting the truth about the role of the most senior soldiers on the spot. And, goes without saying, there was no criticism of the Tory politicians who will have given the go-ahead for the operation. Put plainly, Saville had nothing damaging to say about anybody whose reputation the British ruling class felt it had to protect.